In the first part of this series we didn’t include speaker stands. In this part it will become evident why we made this request. The room in which you place your sound reproduction system, and the way it is setup will have a major impact on overall sound quality. As a matter of fact it is of equal importance to choosing the right components. This factor is more often than not completely overlooked or ignored by most audiophiles. Even famous audiophile reviewers are guilty of failing to have a properly prepared room. It is one of the primary reasons their reviews should be ignored. Without a properly setup room there is little value to subjective critiques, because no one else will ever be able to produce similar results. By following this guide you, and any other audiophile, should be able to achieve very similar results, regardless of the room. The above list begins with the ideal flooring and descends to the worst. Wall to wall carpeted rooms over concrete have many advantages over all other types.Concrete doesn’t resonate, and the carpet dampens acoustic reflections. If you enjoy listening to vinyl, it also provides the best possible platform for turntables. Audiophiles like to put spikes and cones under everything. We have to admit that it looks very precision-like, and adds a certain geeky cool factor to the aesthetics, but in many cases it does far more harm than good. Plywood sub-floors are in many ways similar to an acoustic guitar in that they can act as a resonating surface. Spiking a speaker to this type of sub-flooring, whether it has hardwood, tile, or carpet covering, creates a large vibrating sound-box. This is especially true with subwoofers. In most recording studios the monitors sit atop the console, which like a plywood floor, will resonate. This is obviously undesirable. To avoid this, studio monitors are placed on dampening pads, or specially designed isolation stands. Heavy thick carpeting over plywood creates a stability problem. Unless the speaker is especially heavy, it will not be stable on this surface without some sort of foot, or leg. We recommend adjustable riser feet in this situation because their round flat disc pushes into the carpet, while the carpeting itself acts as an isolator. Spikes are the best choice if you have carpet over concrete. If you have hardwood or tile over either concrete or plywood, you have a serious problem. Installing a large area rug will help. This, however, only goes so far, and if you’re unfortunate enough to have hardwood or tile over plywood, you should seriously consider another room. We assume that most of you will be a Type 1, but if you’re a Type 3, contact your local recording studio supply house immediately and begin hanging foam and installing bass traps. If you’re a Type 2, we’ll do our best to help you. Glass is the enemy! It’s a perfect reflecting surface. Install heavy curtains over windows and close them when listening to music. Large pictures or prints covered in glass should either be replaced with canvas paintings, or covered with a heavy cloth when listening. The same can be said for glass top coffee and end tables. Heavily stuffed furniture will help. In the diagram above we illustrate proper speaker positioning. Each speaker is 36″ or more away from the side walls, having this measurement be identical for both is ideal. The front baffle of each speaker is 36″ from the back wall, and the speakers are spaced 8′ to 9′ apart from one another. The distance between the front baffle of each speaker is of equal distance to the listening position, forming an equilateral triangle. There is at least 36″ (preferable more) between the back of the listening position and the rear wall. In most cases it will be impossible to achieve this exact setup. We have provided it as a reference model. Try to get things as close as possible to the diagram. You may also want to read Speaker Placement by Galen Carol Audio for further reference. This article details the many problems associated with rooms and speaker placement. 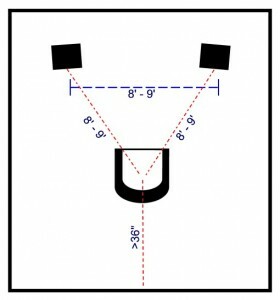 In many cases, moving the listening position back 12″ to 36″, while keeping the distance from the rear wall 36″ or more, provides superior imaging. It’s very much a speaker dependent factor, and may be affected by toe-in. We recommend that you begin by placing them upright with the tweeters on the outside, and the controls set to “0”. Zero sets the frequency response to flat, as measured in an anechoic chamber. Notice that the controls are primarily designed to attenuate, or decrease the output of the high and mid frequency transducers. This is to allow for House Curve. Now, Listen to the recommended tracks from Part 1, and set the controls so that the system sounds good to you. When adjusting the controls be sure to implement the changes to both speakers. In the end both speakers should have their controls set to the same positions. 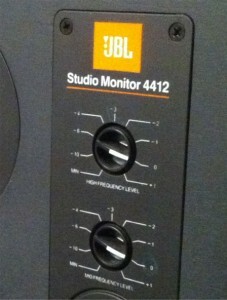 Test them in all four configurations, and then return them to vertical with the tweeter on the outside. We want to work with them in this configuration, but you can change them back to whatever you feel is best later. You should now have a roughed-in tonal balance to the system. There is no exact answer to how much toe-in your speaker system will require. Some speakers systems, such as the Polk SDA series, require none. Most, however, will demonstrate improvements in overall sound quality and imaging when they are slightly toed-in towards the listening position. 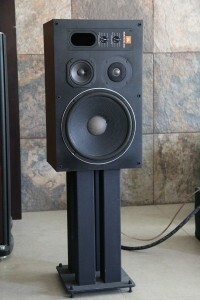 Too much toe-in will neutralize the stereo imaging to the point where you hear two independent speakers. It’s important that both speakers be equally toed-in. The easiest way to accomplish this is with a measuring tape. It’s also helpful to have a partner help with this procedure. Begin by toeing the monitors in 1″. Listen to some good recordings such as Diana Krall. Listen carefully to the vocal imaging. Increase the toe-in to 2″. Again, listen carefully to the vocal imaging. Did it become more more pin-point and detailed? You will need to repeat this procedure several times using various measurements. Feel free to try less than 1″ or more than 2″. The goal is to make the sound-field as life-like as possible. You should probably repeat this procedure after adjusting tilt, and equalizing the speakers to the room. More on that below. Most speaker manufacturers build their cabinets to suit the aesthetic preferences of consumers who intend them for use in their homes. Many modern speakers have narrow front baffles with deep cabinets to make them less obtrusive. There are primarily two or three different sizes of speakers:floor standing, bookshelf, and large bookshelf. “Bookshelf” is a bit of a misnomer because placing your speakers inside bookshelves will greatly reduce their reproduction capabilities. Bookshelf speakers require stands to work properly. Due to aesthetic considerations during design many floor standing speakers can also benefit from stands. Whether you have bookshelf speakers on stands, or floor standing models, you will need to conduct the following tests. Begin playing an excellent recording, and set the CD player or media center software to repeat it endlessly. Listen carefully, paying particular attention to the high frequencies.Now, sit on the floor in front of your listening chair. Did the high frequency response decrease? Stand up, and listen some more. Repeat this process, moving up and down, until you get a good idea of how changing your height affects the sound. Did your system sound best in the chair, below, or above it? Next, measure the distance from the floor to a point mid-way between the tweeter and woofer, or tweeter and mid-range, as the case may be. Using a combination of speaker stands, patio stones, or concrete blocks, raise each speaker so that the mid-way point between the drivers is at ear level when you are in the listening position. Return to the previous recording and listen carefully. Did the sound quality improve? In a live jazz performance the musicians are usually on a stage at least 12″ above the floor. The music shouldn’t sound like it’s coming from the floor or speakers, it should sound more life-like. By raising the speakers you system should be sounding much better, but we’re not done yet. In the diagram above, the speaker is not at ear level, instead it has been lowered slightly and tilted back. The tilt creates ambient reflections, and may or may not be preferable to the speakers at ear level. In most cases the sound-field will open up and become more three dimensional. This is especially useful with classical music. 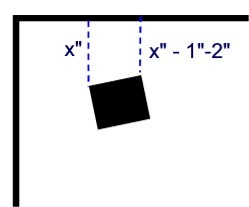 Typical tilt angles are 3-5 degrees. In all cases the mid-way point must be angled towards the ear in the listening position (see above). If you increase the angle much beyond 5 degrees the speakers will begin to sound somewhat ethereal. You can use paint stirrers and washers to manipulate the tilt angle. Not all speakers in all rooms perform well when tilted. The purpose of this exercise is to determine if your speakers in your room can benefit from tilt. If tilting your speakers improved the overall sound quality then the stand required will be lower than if they were positioned at ear level. Go back to the part of this article that discusses tonal balance and repeat it. Follow that by repeating the all the tests. Try to refine things even more. After all the trial and error adjustments you’ve completed, you should have a pretty good idea of your speaker/room interaction, and what works best. You should also know the exact size of stand you will require to complete the system setup. If everything went according to plan, your system should sound much better, but we’re not done yet. In the next part of this series we will introduce some new concepts to improve it even further. Thanks for reading this article, and chime in with your comments below.